Lines from Linderhof: My First Tablescape Thursday Post . . . It's my second anniversary of Lines from Linderhof . . . .
Two years ago today, I made a decision to join the blogging world. It's a decision that I have never regretted for I have enjoyed each and every comment and have made friends far and wide. It was always fun to join Susan and the rest of the posters to see what was on tables on Thursday -- in fact, it made Thursday my favorite day of the week. I've not posted every Thursday for sometimes I didn't have company but I've posted most Thursdays. 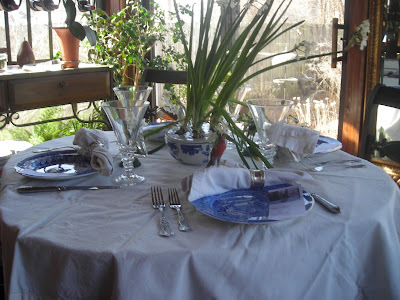 And, as you all know by now, most of my tablescapes feature my beloved blue and white transferware. 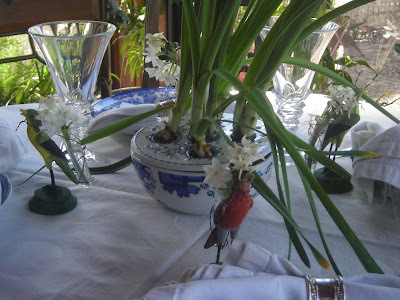 This is mine -- a Paperwhite Luncheon -- on February 4, 2009! And since it is my second anniversary of Lines of Linderhof, it is the final time, you can sign up for the giveaway -- my first! It is a favorite book of mine, well loved and well read, that I want to share with you -- Betty Crocker's Kitchen Gardens, by Mary Mason Campbell, illustrated by Tasha Tudor. If you've commented from Sunday on, you can comment again for another chance to win. If you're a follower, you have another chance to win. I'll draw tomorrow morning -- may the luckiest win! This is one of my favorite books!! Our library had it and out of print I ordered it from Amazon. I just love the sweet little drawings by Tasha Tudor. Don't enter me I already own it. But, it is a great giveaway! Martha-Happy blogaversary! I think I have seen and enjoyed almost everyone of your tables and am always amazed at the amount of entertaining you do. I'd love to be on the guest list sometime! Please enter me for the giveaway too :) and thanks! You set just gorgeous tables. And yes, please do enter me again. This Sherry doesn't have that book. Martha, I didn't realize that you've only been blogging for two years. From your wonderful posts, I thought you were a veteran. But, I suppose the blogging world is rather new. It is the first time I've seen those wonderful bird vases. And, to celebrate a luncheon at Linderhof with those friends for so many years is a true tribute to friendship. Hope you are still treating yourself well as is befitting a birthday girl!!!!! Martha, love those plates...they are my favorites. I love blue transferware! I always love seeing your beautiful tablescapes. I am a follower and would love to be entered in your giveaway. Oh, I would love to have a Linderhof book! And you know I follow! What a lovely tablescape. I'm happy you posted it again as I didn't get to see the first time around. I love your giveaway and would be so excited to win. Thanks for the chance! Oh, I'm a folower too! Happy anniversary! Lovely table - classic. You could post again in 10 years! Dropping by from BNOTP. Very pretty table! And I too am surprised at how much entertaining you do. You mentioned not always having a tablescape, as sometimes you haven't entertained...I set mine up just for fun/photos/Tablescape Thursday, and then put the pretty dishes away...but when I do have company over, I try to have a nice table then too! Martha, Your first Tablescape Thursday is just as beautiful as more recent ones. I absolutely LOVE those bird floral holders. What a fabulous "find". Happy two year blogging anniversary. Martha, I could pick your tablescapes out in a tablescape lineup! They always have a serene and understated element to them that sings soflty to my heart. I just love your style! The blue china is fabulous and the paperwhite centerpiece is one I would love for my own. You have a element to your tables that is so personal and well bred that all of your tables leave me with the desire to come and visit! The giveaway sound wonderful. I have never read that book, but I'm sure I would love it. Thank you for entering me. I'm glad to see another one of your wonderful tables! I only joined TT a few months ago, so I've missed a lot! I love how you always have such a cute little (and delicious) menu at each place setting! It's so fancy and fun to have a personal menu, I think! Glad you reposted this because I hadn't see it. Love the story of your and your friends meeting for lunch each month. Congratulations on celebrating two years. i love tablescapeing. just something i've been playing with for only about 6months. it's nice seeing your very first one. i love paperwhites too. your dishes are always lovely and i'd love to be the 5th at your luncheon someday. Anytime, you visit the prairie, Linderhof's doors will be open -- for a luncheon, for a cup of tea. I'd love to visit with you! That is such a pretty tablescape. I really like Spode Blue Room china and blue and white color schemes. Congrats on two years of blogging. Wow! 2 years! Happy Anniversary. I'm a follower now. 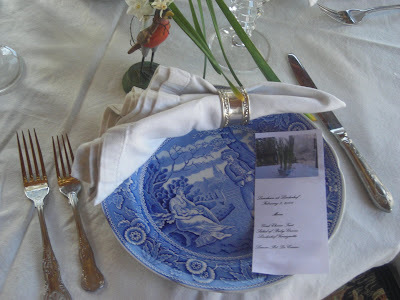 You have beautiful tablescapes and this one is perfect the the blue transferware. Did Oliver have to go outside? He is adorable! I enjoyed your tablescape. I've recently purchased some blue transferware, and I love seeing inspiration to use it. Tasha Tudor is my absolutely favorite illustrator. I am also a follower. Thanks for the giveaway and sharing your tablescapes. OH, I've been wanting that book for the longest time! Tasha Tudor is my favorite! Thanks for the giveaway. 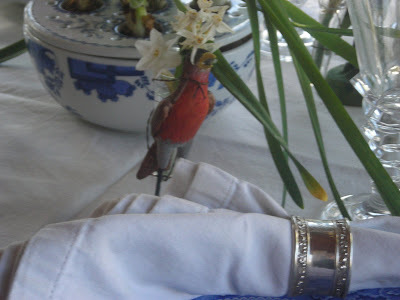 Martha.....I love your gorgeous tablescapes and your pictures. Thanks for sharing. So pretty! I love the bird vases. Happy Anniversary! How wonderful to have a monthly lunch to catch up with your friends! I love this book and now I can read it any time I want or need to . Thank you so much for sharing this lovely gift with me .